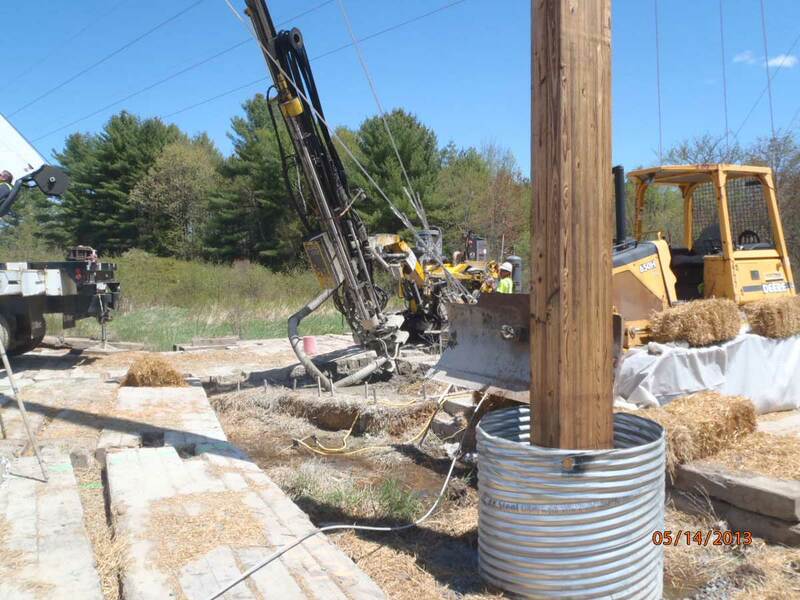 Drill, install and grout for guy anchors on 115kv & 345kv transmission lines in Maine, in and out of existing T-line corridors with various geology. The transmission contractor, Hawkeye, requested guy anchors in some very tough geological conditions in time to meet their wire-pull schedules. Our challenge was to put in 14 rock anchors in very boggy ground. 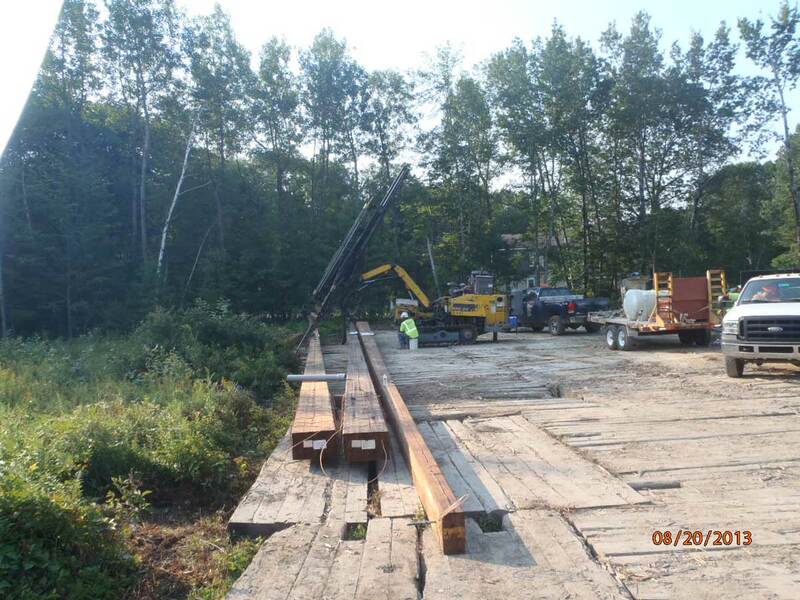 We were dealing with 70 feet of overburden, and an angle of 52 degrees with a 2% tolerance. MD&B successfully prevailed over the challenges. We developed some inventive ways to get the job done, drilling up to 100 feet on some of the holes, and casing the holes. The customer was very happy with the outcome, and the MPRP Site Safety Supervisor was extremely complimentary of the level of excellence the crew displayed. We recently had a structure on the MPRP, Section 3021-116 that presented a significant problem to us. Structure 116 is a running angle (ECR-2, 95'/H2) that requires 14 anchors. This structure is setting in a wetland just south of River Road in Biddeford. Hawkeye crews tried the installation of helix screw anchors of various depths and they would not hold. The ground conditions were so bad that our concrete deadman anchors would not have held. Your suggestion: that if we could hit ledge in 40 feet, your crew could install rock anchors. The first few anchors did hit ledge about 40 feet down, but then it got worse. As you know, the remainder of the anchors were at 90 to 100 feet, in some of the worst soil we have encountered on this project. You and your crew stayed with this work and completed the remaining anchor installations in due course. Without your dedication, we would have been at a standstill waiting on this completion. The 3021 line progress and the installation of conductors would have been seriously impeded, causing us significant delays. This was a tremendous boost not only for the project, but also for those who had the opportunity to witness men who are dedicated to their work and getting the job accomplished in a timely manner. Again, we want to thank you and your entire crew, for a job well done, in your efforts." 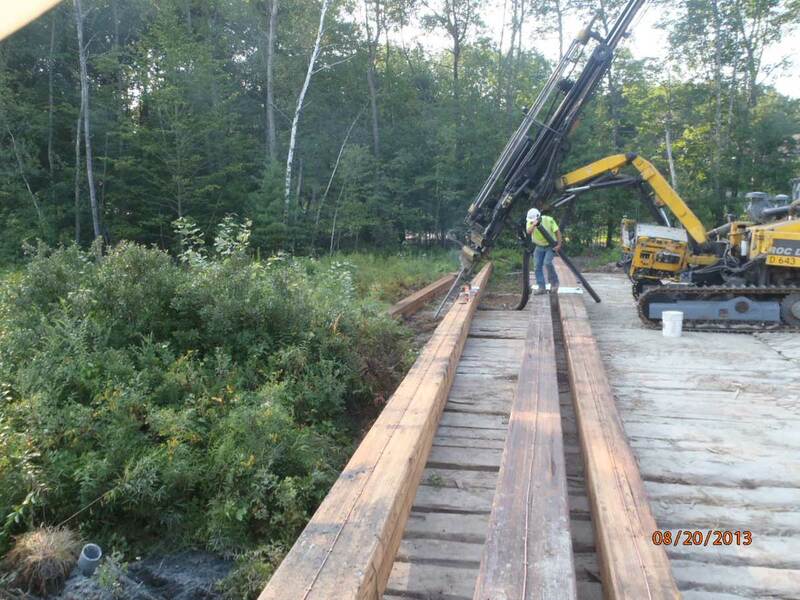 The crew who performed the drilling and blasting work at the Mansfield Hollow project exceeded all of our expectations. Their hard work, attention to detail and ability to adjust to changing conditions kept our project on schedule and completed the rock removal portion without incident. The professionalism and safety first mindset demonstrated by the crew made them a pleasure to work with. 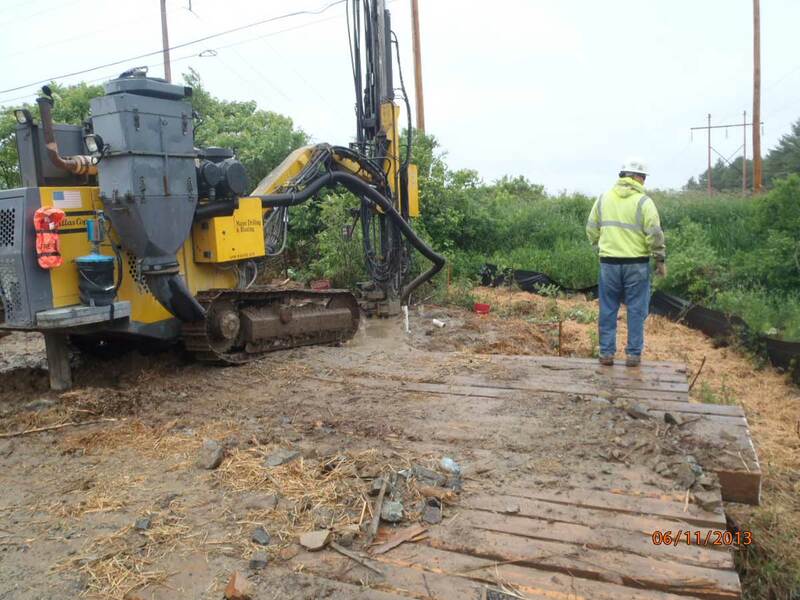 Thanks again for the hard work and we will be calling MD for all of our drilling and blasting needs."